At a Glance: FARM is a destination restaurant inside the luxurious Carneros Inn focused on delivering an elegant yet casual dining experience using the finest farm to table ingredients. Expect stellar service and stunningly beautiful plates. Perfect for: Special occasion dining, romantic dining, impress your date dining. Wally Says: Modern farmhouse, gourmet chefs, I never knew farmers were such foodies! Napa is filled with lively, upbeat, bistro-vibe restaurants but where do you go when you want a more refined, more elegant dining experience? For that I go to FARM, the upper end restaurant inside the Carneros Inn that features foodie worthy dining in a relaxed and sophisticated setting. The design features a living room styled alfresco lounge, patio dining, cathedral ceilings and two fireplaces, white tablecloths, the works. Date, be impressed. TIP: If you're driving in for dinner, come a bit early to walk the grounds of this unique resort. It's really unlike anything you've ever seen, a place to bookmark for your next visit. Fancy cocktails to start the evening at the Carneros Inn's FARM. One of my dining rules is to always start with a cocktail, especially when it's served at a trendy looking bar serving custom craft cocktails. Modern, hip, the bar at FARM is welcoming and friendly and the cocktails creative and sophisticated. And of course, the wine list at FARM is extensive, even featuring wineries within walking distance to the resort. For dinner corkage is $25, waived if you purchase one of their bottles as well. Simply stunning plates, beautiful presentation, and flavors, oh yes, the flavors are fresh and vibrant. Make sure you get the Agnolotti, tiny ravioli's with fava beans, green almonds, fromage blanc, and lemon preserve. It's a starter so the portion is tiny but it's so good that you'll need to watch your table manners when the person next to you wants a bite. Um, no, get your own! In fact, everything appears to be over the top delicious at FARM. Designed by Executive Chef Aaron Meneghelli, the farm-to-table menu showcases simple, elegant food based on the natural abundance of the surrounding region. FARM is refined in presentation and flavors and each dish includes at least one element from the on-site farm. And yes, vegetarians get more than the obligatory nod with plenty of options, all equally delicious. Expect to spend around $60 per person before drinks for an appetizer and entree. Portions are sized appropriately for the rich ingredients though some might want to add a salad or dessert to round it out. A $115 tasting menu features a 5 course dinner, a great option for a special occasion. Service is polite and professional and the noise level low enough for an actual conversation. Wow, what a concept! So Napa has plenty of good - great - restaurants, so many that it's hard to choose. That said, FARM should make your short list if you're looking for beautiful plates of exceptional ingredients deliciously prepared. TIP: Doing a day trip to Sonoma? 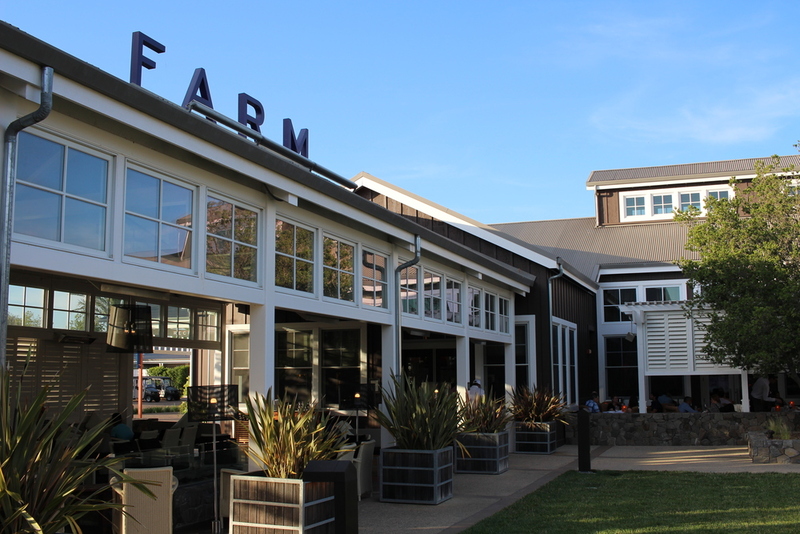 Make FARM your dinner stop on the way back to Napa. For the first time ever, FARM at The Carneros Inn (4048 Sonoma Highway) is pleased to announce Sunday brunch. Previously only open for dinner, FARM invites guests to enjoy the summer brunch season on FARM’s newly-renovated outdoor patio and with a round of bocce. The family-style brunch will be offered from 10 a.m. – 2 p.m. every Sunday, with the first brunch on July 3, 2016.